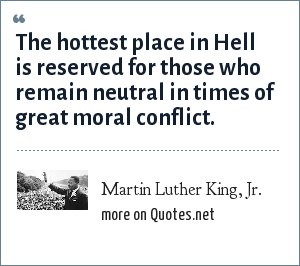 Martin Luther King, Jr.: The hottest place in Hell is reserved for those who remain neutral in times of great moral conflict. "Martin Luther King, Jr. Quotes." Quotes.net. STANDS4 LLC, 2019. Web. 23 Apr. 2019. <https://www.quotes.net/quote/49540>.